At least a couple of times each year, I am asked if our church “does altar calls.” My typical answer is “No, we don’t normally do ‘altar calls.’” The next question is “Why not?” If the answer is a “deal-breaker,” then I will hear a polite, “Oh . . . I see.” The intonation communicates the unspoken thought: “You’re one of those preachers.” I suppose they mean Calvinistic. The “invitation” typically follows a sermon. In my experience, the sermon may or may not have anything to do with the gospel. My guess is that “invitations” were given in order to accomplish two natural impulses in the preacher. First, we want to see people submit their lives to Christ and respond to the gospel. Second, perhaps preachers don’t think they’ve done their “job” without adding the gospel invitation at some point in the sermon. I suspect this arises because preaching the gospel in the sermon is almost a foreign notion in much of contemporary American preaching. But back to my phone caller who asked me why I don’t give an invitation. We began a brief discussion about why he thought an altar was necessary. What was curious was his conclusion as to the necessity of altar calls. He believes, as many do who want to see altar calls, that people need to be given an opportunity to respond to the gospel. Typically, someone will argue that since Jesus walked publicly to his crucifixion, a repentant sinner should not be ashamed to walk publicly down an aisle. Once the sinner has “come forward,” he or she is invited to pray “the sinner’s prayer.” It’s at this point that I asked my friend what “coming forward” was to accomplish. He told me that the intention is to give the repentant sinner assurance that their sins are forgiven, and that they are saved. Then I asked, “How do you know that?” My friend admitted that he did not really know that since no one can know the heart. So, I asked, then why are you assuring a sinner of something that you cannot affirm has happened in their heart? If you assure them of something that you cannot be sure has happened to them, they may believe that they are converted (you are the expert) and yet walk away unconverted. They may have put their assurance in their response and your affirmation rather than Christ. That seems more spiritually harmful and less helpful. He didn’t have a good answer; although he did chortle a bit. Here’s the point. In all the years I saw and poorly practiced “altar calls,” I have also seen some of those people walk away from church never to return. I have also heard people mistakenly put their assurance of salvation in their response: the walk down the aisle, or in their prayer, or in the signed and dated card still carried in their wallets. The sadness of this “assurance” is its inherent weakness: the repentant sinner. Responses to the gospel not the places where assurance is found. Trust in any form of response has one thing in common: what I have done. The Bible is clear that response to the gospel is based on what Christ has done. My friend wants to talk with me further about my deficiency as a preacher. I suspect we will. However, what this conversation prompted me to do is to analyze the psychology behind and roots for the potential for spiritual manipulation behind altar calls. 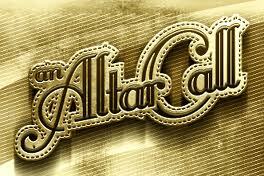 In my next blog, I’ll tell how altar calls were invented and why. By the way, if you are in anything but a Liturgical church (i.e., baptistic), where is the altar?